There are numerous locations within Portland to rent a car and get around with ease. VroomVroomVroom compares rental cars from major brands including Avis, Budget, Dollar, Enterprise and Hertz so you can easily find a vehicle that will best suit your budget and needs. Just sort by price to see the cheapest car rental in Portland. Portland, the most populated city in Oregon, is located near Columbia River. This city features volcanoes that have erupted as well as having the largest park in the United States within a city. There are plenty of activities, attractions, and destinations on the streets to keep the entertainment flowing. Wide selection of vehicles: There are plenty of cars to choose from in Portland since we compare different brands. You can also compare RV rentals in Portland. Great rates: Our Price Promise assures you of finding a great deal. Trusted since 2001: We are the experts in rental cars so feel free to contact us if you have any query. The busiest time of the year in Portland is between June and August so make sure to book a car rental and accommodation in advanced since this is the tourist peak season. 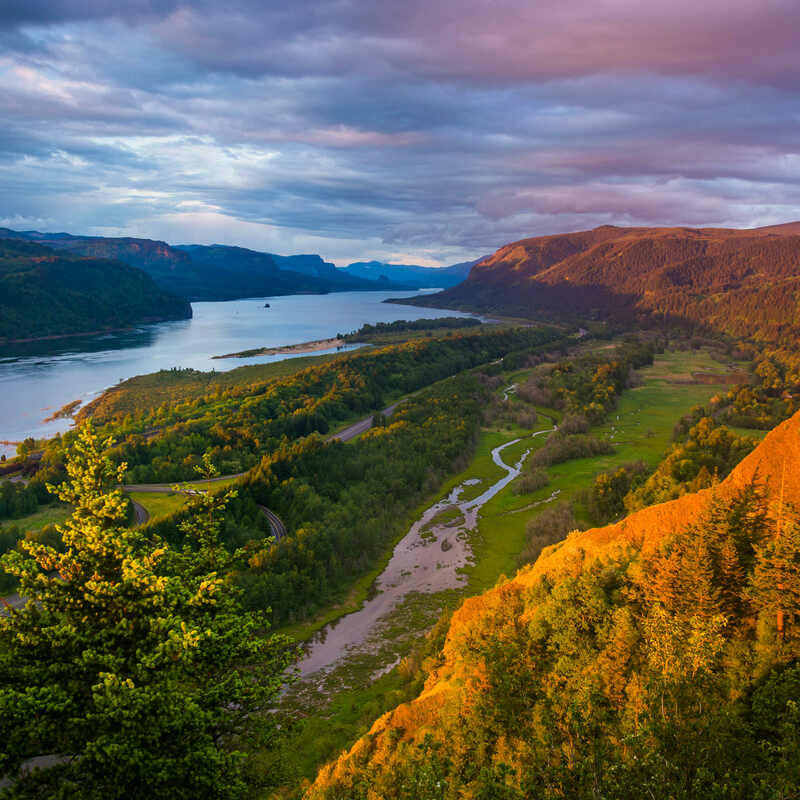 The warm weather makes it ideal to drive your rental car to the city of Portland towards the coast to the Columbia River Gorge, a canyon that is home to the Columbia River. If you have a tight budget, the best time to visit is between September and November when the vacation season ends so expect a drop in hotel rates. Portland provides many gardens, parks, museums, tours, and even has many evening hot spots to enjoy your night. Plenty of hotels are available for your stay, no matter how long you visit. Renting a car will provide you with convenient transportation in the city and perhaps, save some time while you're in town. Drive over to Lan Su Chinese Garden to enjoy a wonderful landscape experience. If you're a book lover, you may want to check out the massive Powell's City of Books and enjoy a delicious, hot cup of coffee while you're there. If you love tours, the Pittock Mansion will provide an amazing exploration of a century-old 23-story mansion. If you drive over to Washington Park, the Oregon Zoo can provide an enjoyable adventure of wildlife. Having a car rental is essential to making your way around the city of Portland, especially if you want time to see more of what this magnificent city has to offer. Finding a cheap rental car is not hard in Portland, especially with many car rental locations to choose from. Jump in your rental car and head to the 3D Center of Art and Photography in Portland! Check out the old style 3D vintage cameras and other types of viewing devices on display, which also include information panels that will take you through the history of 3D! 1. Chinese Garden. Visit the Chinese Garden, situated on the Willamette River. This garden has been designed to be an exact image of a classical, serene Chinese garden. With its traditional Chinese architecture and a quaint tearoom, you could be thousands of miles away, in the heart of China. A real treat for the senses. 2. Saturday Market near Burnsside Bridge. For authentic Portland why not take a trip to the Saturday Market near Burnsside Bridge? A huge open air market, hosting hundreds of stalls, kiosks and tents, this market also is the pitch for musicians, magicians and street entertainers. The food vendors alone make this visit worthwhile and you get a real taste of Portland's way of life. 3. Rose Test garden. Indulge your sense of smell with the wonderful aromas to be found in the Rose Test garden, on Kingston Avenue. First established in 1917, this garden boasts a huge range of roses, many which are extremely rare and fast becoming unique. For more information on the Rose Gardens click on the link. 4. Oregon Maritime Museum. Spend a day at the Oregon Maritime Museum, which is actually a tugboat called the Portland. This gives a real flavour of the history of Portland (and Oregon) and the important role which the rivers and sea have played in shaping modern day Portland. 5. World Forestry Centre and Museum. Learn a little about forestry and its history at the World Forestry Centre and Museum SW Canyon Road, which shows just how important forestry is in Oregon and the role of conservation in forestry. Avis Portland Downtown Parking Garage - 330 Southwest Washington Street, Portland, . Avis University Place Hotel - 310 Southwest Lincoln Street, Portland, . Budget Downtown Portland Or - 330 S.W. Washington Street, Downtown Parking Garage, Portland, . Budget Portland - 310 Southwest Lincoln, University Place Hotel, Portland, . Enterprise Portland -dwntwn East - 611 E. Burnside Street, Portland, . Enterprise Portland City Center - 445 Sw Pine St, Portland, . Enterprise Hollywood District - 2740 Ne Sandy Blvd, Portland, . Enterprise Portland -dwntwn West - 1623 W. Burnside Street, Portland, . Enterprise Freeman Motors - 4841 Sw Macadam Ave, Portland, . Dollar PORTLAND DOWNTOWN, OR - 132 NORTHWEST BROADWAY, PORTLAND, . Hertz Portland Hle - 330 S.w. Pine Street, Portland, . Hertz Crown Plaza Hotel Hle - 1441 N.e. 2nd Avenue, Portland, . Feedback: live chat was very helpful and answered a question I needed answered before I could book.